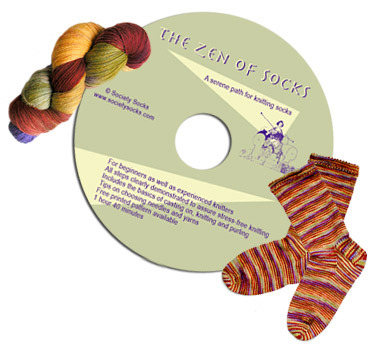 The Zen of Socks Instructional DVD! This is a great tool for a knitting novice and also for an experience knitter. You will learn how to knit and continue on to learn sock knitting techniques. I am an avid knitter, and I am also an award winning filmmaker, web and graphic designer. I combine these passions into one great video. The Instructional DVD consists of over 1 hour and 40 minutes of clear visual instructions. Dvd is divided into 8 sections, all easily accessible from the top menu. To your left is a short sample (cast on and the fabulous kitchener stitch) to see how easy it is too follow the instructions. After purchase you will be also emailed a pdf file with step by step instructions. New: Special Gift Edition. 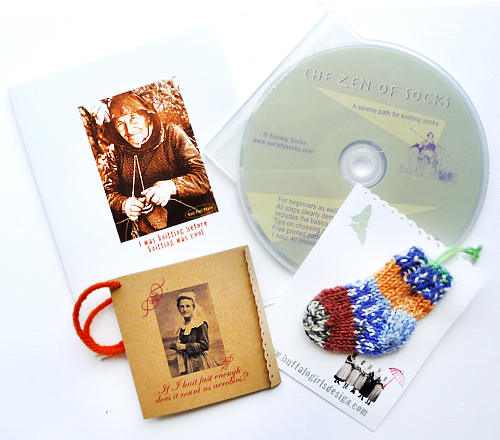 Includes The Zen of Socks DVD, tiny hand knitted sock pin, gauge card, and a fabulous note card especially designed for knitters. A happy customer's comment: "Watched this video and I found a number of tips that will help not only with my sock knitting but other knitting projects as well! Great job." Receive one free knitting inspired greeting card with every DVD order. There are two convenient options to pay: google or paypal. Happy knitting! "I just wanted to tell you how much I like the DVD and to thank you for introducing me (and the world) to knitting socks. and I love to have nice socks to wear that I made myself." and more comfortable feet. The DVD is wonderful, inspirational, and personal"
The Sock Dvd is really helpful. I already have the first half of a what looks like a sock on the way. These artworks may not be reproduced without the permission of the artist.